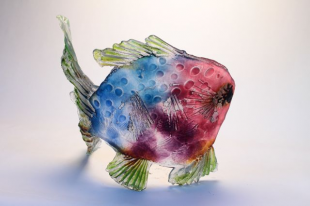 After graduating with honours in 3D glass design from West Sussex College of Art and Design, Amanda went on to study Art in Philidelphia and Boston before setting up her own purpose-built glass studio. Working in sand cast glass is a physically demanding technique which enables her to produce large pieces of art which take glass sculpture to its limits. Her work is held in numerous private collections and she has exhibited in several international galleries across Europe and the USA. Top of PageCopyright © 2019 Bridgegate Gallery. XHTML, CSS, Section 508, WCAG.